Italy’s Interior Minister Matteo Salvini, knowing full well that most Italians back his harsh new stance of refusing migrant ships to dock at any of Sicily’s ports, stated this afternoon that 2 further NGO ships which are near the Libyan coast can forget about returning to Italy afterwards should they pick up any African migrants. Earlier this week, the decision of Italy’s populist minister to close its port to the migrant rescue ship Aquarius, brought a European diplomatic conflict after Malta did the same and both France and Spain criticized Italy. 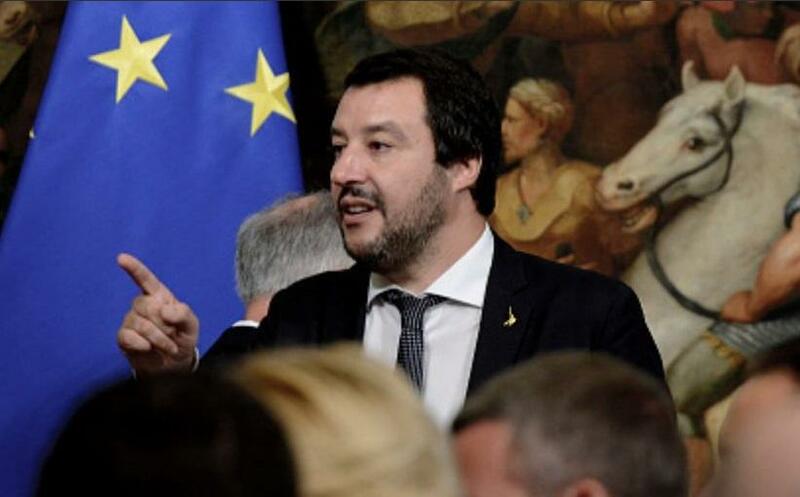 But Mr. Salvini stood firm after which Mr. Sanchez, Spain’s new leftwing Prime Minister decided to accept the Aquarius and offered it a safe haven in the port of Valencia, to where the ship is now heading. According to El Pais, Spain’s biggest newspaper, most Spanish citizens do not back Mr. Sanchez’s stance in this matter however, and it, therefore, remains to be seen whether he will now allow the two additional ships port in Spain. no proper papers to entry ~?=no-no , wow hope those that travel ,learn sooner, that proper papers are required as well for various permits … is someone in that country not informing travelers ~ ? new classroom education subject~??? might help under one of those apparent community programs that communities push on school systems (verse educational learning) like the one that got going years back that even in kindergarten and grade 1 and up , basic assure your little ones to go to THEIR' teacher with concerns .. wow like someone patted my bottom or spanked or fluffed the crinkles out of clothes so look ironed.. and wow your the pedo !! !like a mom and dad changing a diaper ~! oh gosh it can be so twisted and the kid gets removed from you your own kid ..,seen that happen very sad, daycare or you little on in kindergarten said something that fit the wording .. but not really fit the wording . think for those kids and those uninformed travellrs that their country sets them up for a probable loss….. community programs with parent etc attendance may help those in other country help those that travel with less knowledge of consequence thus their independent survival is paramount and may avoid certain travel .certificate would be help full of those that participate in program to validate their knowledge, as much as a kindergarten enjoys a degree from ~ kindergarten passed to gr.1 ~! to await many years to the 12 zone. maybe the world will find out that some-leaders have done wrong and will be cared for in different way than like the polite Canadians approach. eh ~? even they have a limit , just an opinion like the newsy one.,named above…. If these "migrants" want to change their world, they need to be the change where they are at. If the Muslim way of life is so bad where they are, one of two things has to go. None of which is their geographic location. The muslims already invaded that area centuries ago. It would be in their best interest not to let them in again. Send a boat out to meet them with water and food, send them all back home where they came from.. END of that issue. Never let any migrant ship dock, anywhere, the problem will stop quickly… Refuse call to port.